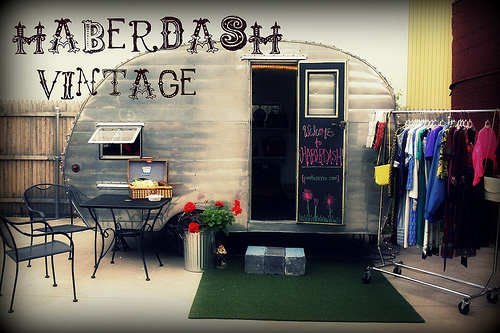 I have driven by, walked by, peered in but never actually been in the glamorous Xtabay Vintage boutique. I am always amazed at whats in the window but I am either there too early in the day or too late in the evening. My daughters and I are so excited because finally this week we will make our way to this shop between the hours of 12-6. 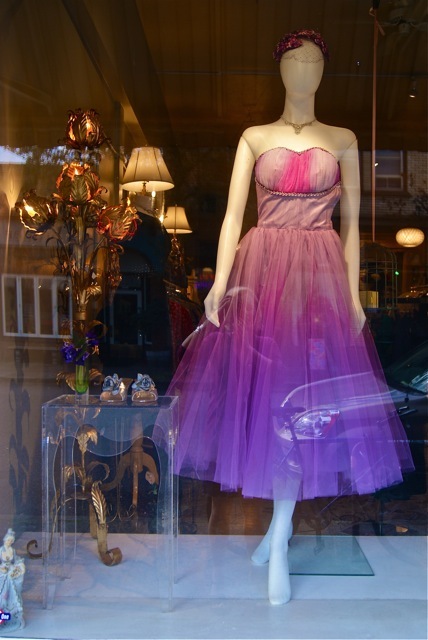 If you are ever in the area of Xtabay on Clinton St make a point of stopping in, if you are out of the state, make sure and scroll down through the photos on the blog, you will fall in love with some dress I am sure and they say they will ship. Click here if you want to check out their blog. 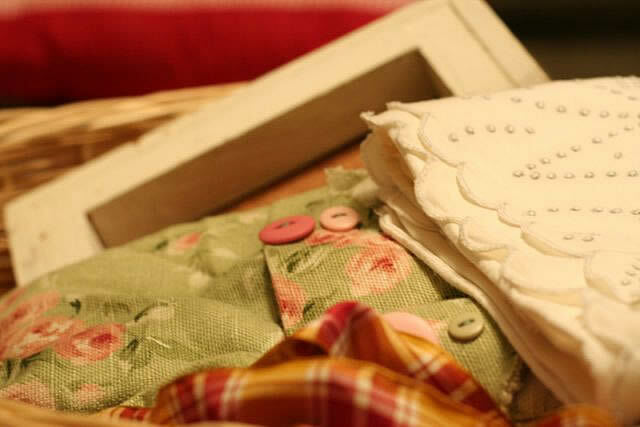 This entry was posted in Check this out!, Thift Stores, vintage on October 18, 2010 by Deanna. My friend asked if I wanted to hit the bins with her last night. I was so excited, cause its been a while and she is the only person I know that can dig through those bins with such force and reckless abandon as me. We did a great job and left with 26 lbs of stuff(or crap as some like to say). Here are a few of the things I found that I am excited about. The mint green flower material is going to be used for more of those Christmas Tree ornaments but these ones will be year round trees. The frame is for my cork pin board that I am excited to make. 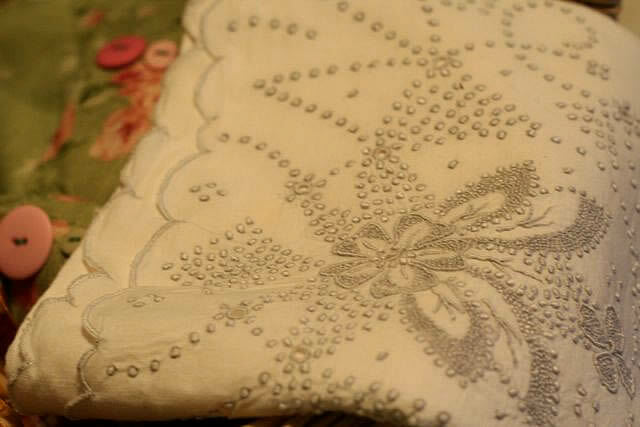 This vintage pillow case is so feminine and dainty, it was finished but never used, still has the dark marks where they sewed and was never washed. I absolutely love it! The ribbon is just great for any use. I am sure it will be used for gift wrapping. 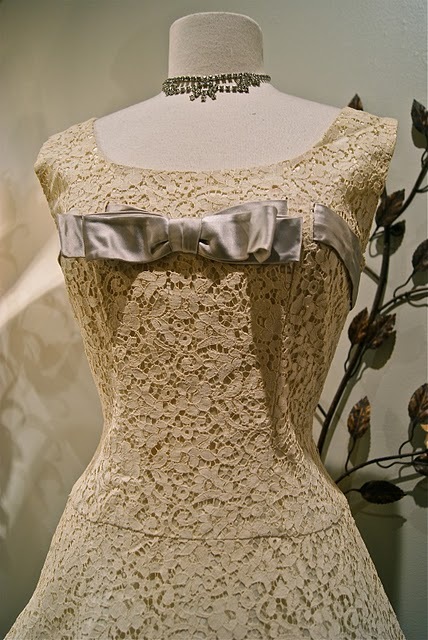 This entry was posted in Recycled, Thift Stores, Thrift Finds, vintage on December 29, 2009 by Deanna. Lately when I arrive home after work I find my daughter sitting on the couch watching Friends. I love to sit and watch Friends with my girls but sometimes I think we may watch the show a bit too much. For example on Sunday we were sitting at a restaurant eating lunch and our 12 year old asks; “What does a restraining order mean?” My husband and I look at each other, wondering where she heard this word, so I asked, “Why are you asking?” and her reply, “well remember when Phoebe gets a restraining order?”. We started laughing. Or another good one would be when she told us; “I had a dream and Joey and Chandler were in it”. See my dilemma? So yesterday, I arrived home to find my little girl watching Friends again, I told her that I was going to the thrift store and asked her if she wanted to join me, in which she responded with a big NO. So I told her to get her homework done while I was gone and went on my way. Her last words were, “even though I am not going with you, you will find stuff for me too, right?” Funny girl. I had a purpose for going to the thrift store, I was looking for certain items, but did not find a single thing on my list, but I did find some things that I am sure I needed. 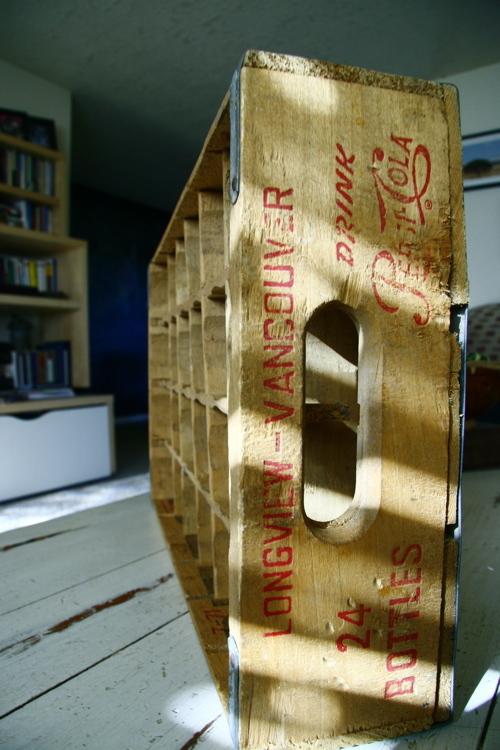 I love this old Pepsi crate, not sure what I will do with it yet. 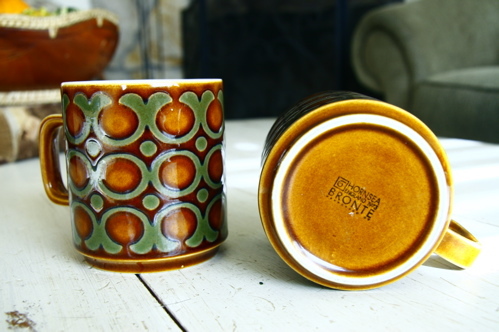 These mugs say England 1973, they would make a great Christmas gift with coffee. I did end up with some great clothes too, but will have to model those for you at a later date. Enjoy! 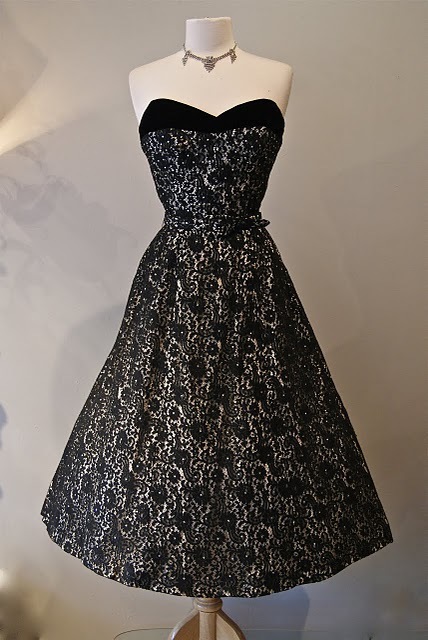 This entry was posted in Thift Stores, Thrift Finds, vintage on November 10, 2009 by Deanna. I did a little shopping today at my favorite thrift store – the Red, White & Blue Thrift Store in Gladstone, Oregon. After a nice lunch with my mom, I decided I would stop by the Red, White & Blue to see what I could find. 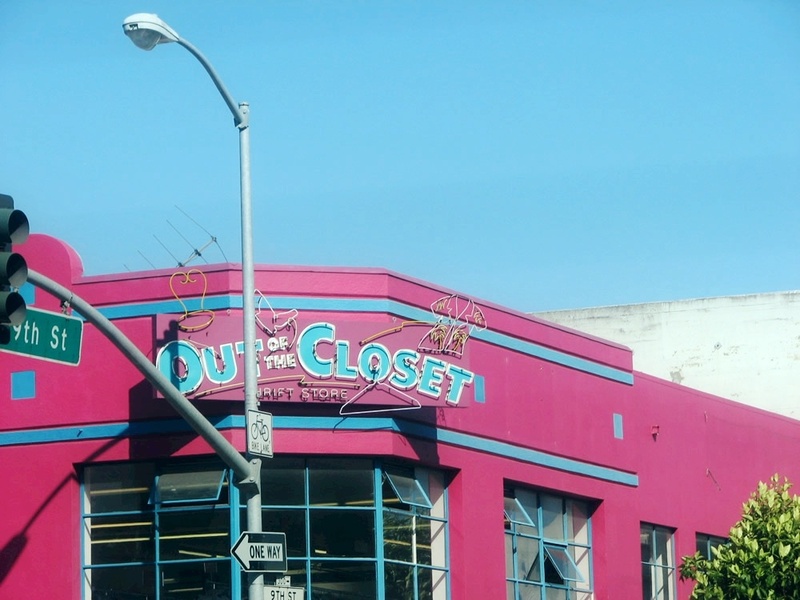 They have the best deals in thrift shopping with specials for everyone everyday. And apparently on Wednesdays its Senior Citizen day and they get 50% off everything. I was so bummed when I heard that because I had just dropped my mother off at her house. But it didn’t stop me from finding some great deals without the discount. Stretchy strapless number from Express - even the umbrella was found at a thrift store. Just thought the way the sun made those spots on the lens looked cool and it really was raining. 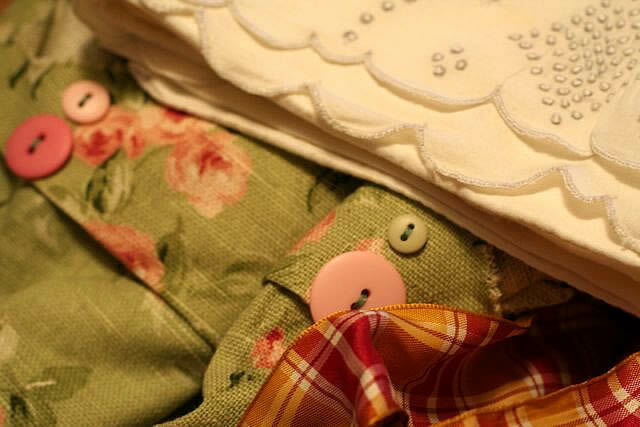 This entry was posted in Recycled Finds, Thift Stores, Thrift Finds on September 23, 2009 by Deanna. Today is National Thrift Shop Day! I hope you all can take a trip, even if its a quick one, to your local thrift shop and check out their specials in honor of National Thrift Shop Day. 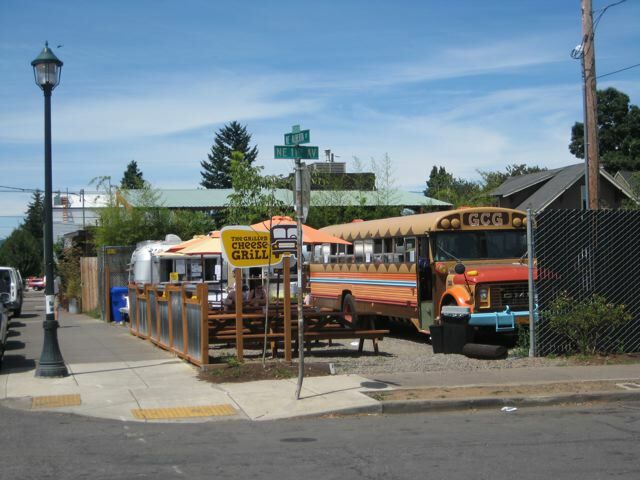 I have a pretty busy day but I am hoping I can do a quick 10 minute stop by at the Lil’ Gypsy down the street. Ok scratch that idea, they are closed on Mondays. I will have to see if they have anything going on at the Goodwill near our house. Happy Hunting! And tomorrow you will finally get to see some finished dresses! 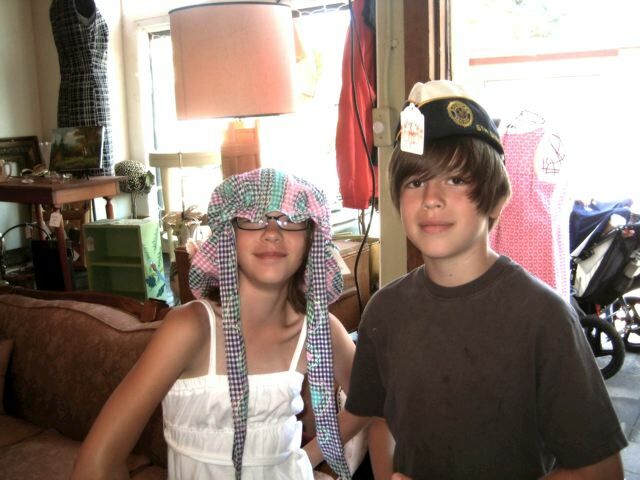 This entry was posted in Thift Stores on August 17, 2009 by Deanna. Every few weeks(as you may or may not know) my family along with some friends, like to make a trip to some of our favorite restaurants/shops on Alberta St. This time we tried something new – The Grilled Cheese Grill – where I tried the BABS, which is Bacon, Apple, Blue Cheese, Swiss on Rye. It was delicious! You can eat in the bus or out under the umbrellas. We also made a stop at Swoon(the used, vintage shop) again to see what great deals she had, but I didn’t buy anything this time. I couldn’t find anything I couldn’t live without. But I did get a great shot of my daughter and her friend with these vintage hats on. Of course my daughters little prairie hat is upside down but she clearly doesn’t care. While in the shop we talked a bit to the shop owner and she was saying how she no longer will buy anything from outside the U.S. and is trying to stay local. It excites me when I see people who are making changes that clearly help the environment. 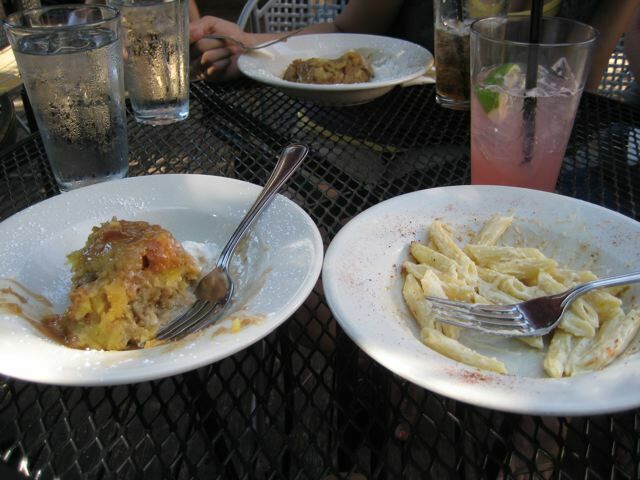 We also made a stop at the Halibuts, then La Sirenita, Random Order, for pie of course, and then Bernies Southern Bistro, which we were pleasantly surprised when they had a happy hour, where all the food was only $3. And the atmosphere cannot be beat, sitting on the back patio with shaded trees and with the temperature like it was Saturday made it feel like we had left Portland and transported into the warm balmy south. This is my mac n cheese and Banana’s Foster Bread Pudding. Amazing to say the least! And yes I was eating them at the same time. This entry was posted in food, Thift Stores on July 20, 2009 by Deanna. One of my favorite stores to visit in Portland is Buffalo Exchange. I always seem to find way too many clothes that I want to take home and have a hard time leaving anything behind. This summer the fam is taking a ‘little’ vacation down to San Francisco. I am looking forward to spending some family time together. The ride down will be, I am sure, very interesting, if not a bit much at times. But thats whats so fun about a road trip…family fun and fighting all in one. So to get ready for our trip, my daughters and I are planning to take some of our old, tired clothing up to Buffalo Exchange to see if we can make some spending money for our vacation. Hopefully I can stick with the goal of making money and not spending money while I am there. 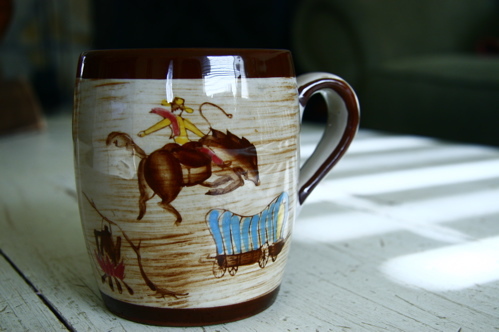 This entry was posted in Recycled, Thift Stores, Thrift Finds on June 16, 2009 by Deanna.